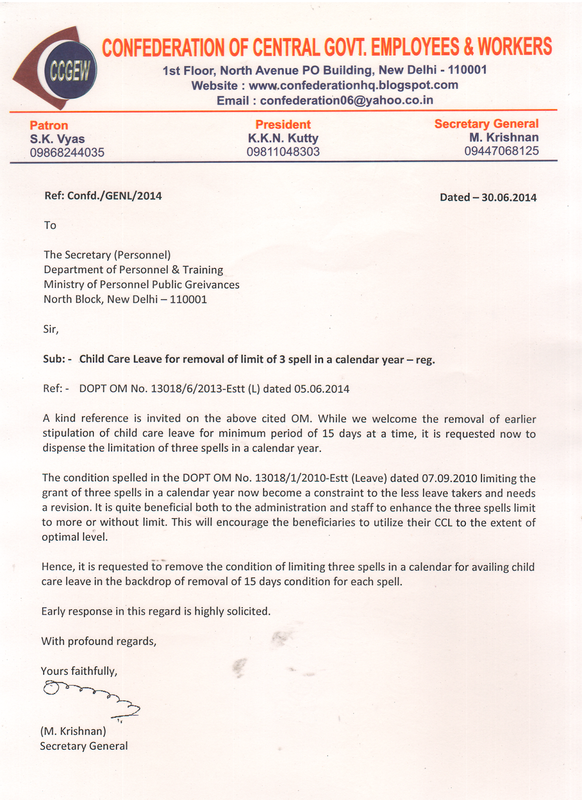 Confederation writes for removal of limit of 3 spells for Child Care leave in a calender year. In an unprecedented move, the Government of India, Ministry of Communications & IT, Department of Posts, has issued orders on 24.06.2014, granting trade union facilities to the Bhartiya Postal Employees Federation (BPEF) and all its affiliated Unions. Even though in the order it is mentioned as limited trade union facilities, in effect almost all the facilities granted to recognized Federations / Unions is extended to BPEF also, including channel of communications, meeting with senior officers and office accommodation subject to availability. We vehemently oppose the above decision of the Government, not because trade union facilities are granted to BPEF, but because of the way in which it is granted, flouting all the existing rules. Government of India has issued the New Recognition Rules (NRR) in the year 1993 viz., the CCS (RSA) Rules, 1993 and it clearly stipulates certain conditions for grant of recognition and trade union facilities to Federations and Unions. As per the CCS (RSA) Rules - 1993, membership verification shall be conducted under check-off system once in five years. Those unions getting minimum 35% will be recognized as the first Union and those getting minimum 15% membership will be granted recognition as second union. Accordingly last membership verification was conducted in the Postal Department in the year 2010 and those NFPE Unions got 35% and FNPO Unions got 15% are granted recognition and trade union facilities. Most of the BPEF Unions except one Union in Postal Accounts got less than 5% membership only and hence they were not granted recognition and trade union facilities. Now in blatant violation of the provisions of NRR and also circumventing the rules for recognition, Government of India has issued an executive fiat granting trade union facilities to BPEF and all its affiliated Unions. Thus, those who are the custodians of the law themselves have violated it. This is nothing but naked nepotism and hence we protest and oppose the order. Secondly, it is a case of arbitrary discrimination. FNPO affiliated Unions which failed to secure 15% membership in the last verification are not granted any trade union facilities so far. Similarly, the request for grant of recognition and trade union facilities to the newly formed Gramin Dak Sewaks Union of NFPE [AIPEU GDS(NFPE)is still pending before the Government, even though it commands support of more than 60% membership of Gramin Dak Sevaks. How can the Government single out BPEF Unions alone for trade union facilities? Why such facilities are denied to similarly placed Unions? Where is the provision for such arbitrary discrimination? It reminds us the famous writings of George Orwell – “All animals are equal, but some animals are more equal than others”. Thirdly, when the Writ Petition of BPEF Unions for grant of recognition and trade union facilities as well as challenging the provision of CCS RSA Rules, 1993 was rejected by the Honourable Madras High Court in the year 2010, and consequently the Government of India, the Department of Posts had completed the membership verification under the CCS RSA Rules, 1993 and granted recognition to the eligible Federations and Unions, how the Executive can ignore the judicial pronouncement and grant trade union facilities to BPEF Federation and Unions? NFPE vehemently oppose this arbitrary orders issued by the Government, which smacks of nepotism and discrimination. We demand the Government to review the orders and ensure justice and fair play. "(f) To examine the principles which should govern the structure of Pension and other retirement benefits, including revision of pension in the case of employees who were retired prior to the date of these recommendations, keeping in view that the retirement benefits of all Central Government employees appointed on and after 01.01.2004 are covered by the New Pension Scheme (NPS)." 1.2 The principles that should govern the structure of pension etc have to be evolved taking into account the relevant constitutional provisions as well as judicial pronouncements by the Supreme Court of India in this regard.
" Pension: Pension means a pension whether contributory or not, of any kind whatsoever payable to or in respect of any person and includes retired pay so payable; a gratuity so payable and any sum or sums so payable by way of the return, with or without interest thereon or any other addition thereto, of subscription to a Provident Fund." From this what is to be inferred is that the gratuity as well as commutation are also part of the pension as a whole. These are also to be treated as pensionery benefits. "Para 2.13: Part II: The concept of "pension" however old in its origin, had the latent and real desire to provide for an eventuality – known and unknown. The known eventuality was old age and probable reduction in earning power, while the unknown eventuality was disability by disease or accident or death. Its real purpose was security, Even though the beginning was oblique, indiscernible and faint, but the germ of an effort to provide security ran through the provision and it is natural that it should have grown and flowered with the development of human understanding and desire to look after and provide for those who deserved it for man has constantly been seeking means by which to enhance his economic security. But the extension of the pension provision from military service to civilian public employment, resulted largely from consideration for the employees and the pressure of their organisations. Some benevolent employer goes to the extent of regarding pensions as an absolutely indispensable complement of wages – a terminal benefit. That, however, is apart from another aspect bearing on pension – the social aspect. The demographic structure of the population is changing because of the greater expectation of life. Thus, those who are now in middle age are going to be nearly twice as big an economic burden to their children as their parents are to them. The problem in such cases, has been tackled as a social obligation, including social insurance for citizens generally." of his employer for whom he has spent the best years of his life. In a welfare state that may also be set to be the responsibility of the Government (where he is not in his employment) and, in more modern society, it may also be set to be the responsibility of the individual. So all three namely, the employer, the Government and the employee or one or the other of them, may be expected to contribute towards the pension according to the social or administrative set up of the country or society where the individual undertakes the service but the one common feature and object of pension is to provide for the old age of the employee for the simple reason that time has eroded his capacity to earn and he is unable to provide for himself. In a country like ours, where we have solemnly resolved to constitute it into a "Socialist" Republic and to secure to us all social and economic justice (Preamble), it behoves the Government to take care of its employees by providing terminal benefit like retirement pension when they become entitled to them. We may refer to the directive principle of the State Policy enshrined in Article 39 (a) of the Constitution that the State shall in particular direct its policy towards securing that the citizens have the right to an "adequate means of livelihood" ….. If, such a citizen is an employee of the State, is it out of ordinary, and not as of a Constitutional directive, that the State should appreciate its duty to provide for him by means of a pension and/or other terminal benefits? (emphasis added) …. The concept of pension, therefore carries within it the germ of certainty, periodicity, and "adequacy". ……. Ours is a Socialist State and the fundamental aim of Social security is to give individuals and families the confidence that their level of living and quality of life will not, in so far as, be greatly eroded by any social or economic eventuality, including the age of superannuation or oncoming disability"
"administrators and civic leaders interested in the improvement of Government services formulated the idea of pension as an efficiency device necessary for the orderly and humane elimination of superannuated and disabled employees no longer able to function efficiently for the proper operation of the system of promotions, for the attraction of better type of employees and for the improvement of working morale"
" A doctrine recently advanced and more far reaching in its implications regard the Public Service as the logical pioneer in the meeting of the old age problem as it affects wage earner in modern society. This doctrine considers a pension as a compensation paid to the employee for the gradual destruction of his wage earning capacity in the course of his work. Retirement being a proper charge against the employees, entire period of active service, the employer should make contribution towards the employees eventual retirement during each year of service of the employee, in a manner similar to that in which he annually sets aside a reserve against depreciation and obsolescence of his plant and machinery. Pensions, according to this doctrine, are an absolutely indispensable compliment of wages." "but even though the Government service pension scheme in our country is non-contributory, it has been contended again by way of doctrinal approach, that this is not really so and that some allowance is made for the missing contribution while determining the salaries"
1.8 The Supreme Court in their Landmark Judgment (which has been approvingly quoted by the 5th CPC in D.S.Nakara and others Vs Union of India (AIR 1983 SC 130) held that Pension is neither a bounty nor a matter of grace depending upon the sweet will of the employer. It is not an ex-gratia payment but payment for past services rendered. It is a social welfare measure rendering socio economic justice to those who in the hey-days of their life ceaselessly toiled for their employer on an assurance that in their old age they would not be left in lurch. The 5th CPC paying due respect to the above observation of the Honourable Apex Court in Para 127.6 of its report has stated that the pension is the statutory, inalienable, legally enforceable right of employees which has been earned by the sweat of their brow. As such the pension should be fixed, revised, modified and changed in ways not entirely dissimilar to the salaries granted to serving employees. (ii) at a standard equivalent at the pre retirement level"
The Court observed that we owe it to the Pensioners that they live, not merely exist. 1.10 From the above observation of the Supreme Court it is clear that pension is payable by the employer i.e., the Central Government to its retired employees which is their statutory and legally enforceable right from which they cannot be deprived. That the amount of pension must be enough to enable a pensioner to live free from want with decency, independence, and self-respect and at a standard equivalent at the pre-retirement level. 1.11 Keeping the above observations and principles and judicial pronouncements in view, we submit below our suggestions for restructuring the existing pensionery scheme in appropriate chapters. We have made our submissions only in respect of issues where we want Commission to consider improvements in the existing provisions. 2.1 The contributory pension system brought in by the GOI through their notification dated 22.12.2003, now renamed as National Pension System under PFRDA Act, has been imposed on Government employees who entered service on or after 1.1.2004. 2.2 This is an illegal act in as much as the Supreme Court of India had held Pension as an enforceable inalienable fundamental right. Therefore it should be scrapped or at least not made applicable to Government employees. This has also divided the CG employees into two categories and therefore it is discriminatory in respect of persons who have entered service on or after 1.1.2004 who had been denied the statutory pension. Any discriminatory scheme is illegal and ultravires of Article 14 of the Constitution. On this count also the NPS cannot be made applicable to the Government employees. 2.3 The Centre for Economic Studies and Policy, Institute for Social & Economic Change, Bangalore in a Study of Terminal Benefits of the Central Government Employees sponsored by the VI CPC had also observed that Civil Services Pension is in the nature of a deferred wage. It is well known that the principle guiding the pay package of civil servants is one of intentionally spreading out the compensation over a long period of time, thereby the wages paid out during the course of the work tenure is kept low by design, and the pension payments made during the retirement phase compensate for the low working wages. "Deferred Wage: In the context of civil servant pension payments, it is argued that, the principle guiding the fixation of pay package is one of intentionally spreading out the compensation over a long period of time, whereby the wages paid out during the course of work tenure is kept low by design, and the pension payments made during the retirement phase compensate for the low working wages. The Supreme Court of India held that pension is neither a bounty nor a matter of grace depending upon the sweet will of the employer. It is not an ex-gratia payment, but a payment for past services rendered. It is a social welfare measure, rendering socio-economic justice to those who in the heyday of their life ceaselessly toiled for the employer on an assurance that in their old age, they would not be left in the lurch." "Larry Williams observes "Actually, civil service pensions, because they are not based on contributions, are best described as deferred wages. Civil servants accept a lower current wage in exchange for the promise of a pension in their old age. If this pension were contributory, they would insist on a higher wage and government would have to either increase taxes or borrow (issue debt) to pay it. The real cost of civil servants is thus much higher than recorded under the current system of cash accounting. A good reform would be to move to a system of accrual accounting setting up at least a notional fund to pay these deferred wages" (Larry Wilmore, 2004)" "Public and private sector pay differentials: A comparison of the public and private sector wages reveals that while the public sector wages for the lower grades compares well with that of the private sector, the salaries of the employees belonging to the higher grades are highly unfavourable to the public sector employees. The post-retirement benefits that the government employees are entitled to act as some incentive to retain them in government sector." 2.6 The above study had also pointed out that expenditure on pensions of civil servants of high income OECD countries on an average is 2% of GDP (less than 1% in Ireland and more than 3.5% in Austria*)(* Source: OECD Social Expenditure Database). But in the 8 South Asian countries it is less than 1% of GDP (Source: World Bank Data base). However, in India between 1964-65 and 2004-05 on an average pension payments (Civil Service pension paid by Central Government) have constituted 0.51% share of GDP. The Pension liability would continue to increase and reach 0.54% level by 2024-25 and remain at that level till 2014-25 after which they would decline as a percentage of GDP according to the same study conducted by Dr.Gayatri at the instance of VI CPC. These figures argue themselves in favour of continuation of the Defined Benefit Pension Scheme for all Central Government employees instead of throwing a section of them to market based NPS. According to 2011 census 62.8% are in the age group of 15 to 60 and only 8.2% are above the age of 60. 2.7 From the above projection it is very clear that the benefit of NPS will commence only after 44 years i.e. in 2044. And during the period it will increase exponentially as because in addition to the Statutory pension liability the Government will be contributing to the NPS also @ 10% of annual salary bill of the CG Employees who have entered service on or after 1.1.2004. "Mainly given the fact that the future liability although may be large in terms of the absolute size is not likely to last very long and does not constitute an alarmingly big share of the GDP which is also on the decline, it appears that pursuing the existing Pay As you Go to meet the liability would be an ideal solution." 2.9 Applying this conclusion we may suggest that the NPS may not be made applicable to the Government employees and all those who had been covered under NPS may be reverted back to statutory pension scheme. The Government may be asked to study the experiences of this scheme in several other countries in the world. In Chile such a scheme has been reversed as because the return which the low paid employees got out of the annuity purchased was not as good as 50% of LPD but as low as 20% of LPD. The UK Government had to pay out of the exchequer large amount by way of subventions in order to ensure that that annuities purchased yield 50% of LPD as pension. It is well known that in USA where there were similar pension schemes dependent upon the market had collapsed during the financial melt down from 2008 onwards. It is estimated that more than 3.5 trillion $ worth of pension wealth was lost. The workers not only lost their pension but also their jobs. Our respectful submission is that taking into account the demographic considerations of India which is a country of young do not need any such market oriented pension scheme, particularly when the international experience is that such schemes had failed and our country can afford to pay pension to civil servants which stands at level of 1% of the GDP. We conclude by quoting the opinions of experts on the future of market dependent pension Scheme. Mr Joseph Stiglitz (Chief economic advisor to former president of USA Bill Clinton, former vice-chairman and chief economic advisor, World Bank, Nobel Prize winner, Professor of economics, Columbia university) said that "Stock market does not guarantee returns. It does not even guarantee that the stock values will keep up with inflation. Privatization would not protect retirees against the social security systems insolvency. Argentina's privatization of its pension system was at the centre of its fiscal woes". quoted the collapse of NASDAQ and Enron. In Britain, Insurance companies could not honour their promises and the Government had to compensate with 8 billion pounds". We have requested the PFRDA Authority to furnish certain information on their working ( copy enclosed). On receipt of this information we may make certain further submission for the consideration of the Commission. (b) Any Special pay or personal pay, or deputation duty allowance. (e) 75% of the running allowance in respect of Railway Running Staff retired after 4.12.1988. 3.2 There are persons who retire after having served for full year since their last increment. The next increment which has already accured to them is however not added to their amoluments for purposes of computing pension and other pensionery benefits. It is therefore submitted that the Commission may kindly consider and recommend that if a person retire on the day he has completed 12 months of service since his last increment, the increment accrued to him may be added notionally to his basic pay and then the pension computed. 3.3 The VI CPC has already recommended that the ten monthly average emoluments or the last pay drawn, whichever is more beneficial, should be the basis of computation of pension. We have therefore no further suggestion to place before the Commission on this issue. 3.4 Casual Labour / Contingent Paid Employees: At present Casual labourers / Contingency paid employees are allowed to count their service towards pension @ 50% of the total period falling between acquiring the temporary status and regularization and full service thereafter. The above benefit is also subject to further condition that such employees should be regularized and absorbed against a regular post. The operation of this condition is so harsh that there are many cases in which the entire service rendered non pensionable because the employee may be retired / retrenched / die before such regularization. We, therefore, propose that the 50% of service before acquiring temporary status and full service after acquiring temporary status irrespective of whether he / she was regularized or not should count towards pension. Similarly these employees have to remain for long durations without any regularisation and are deprived many amenities which a regular employee gets. Not to treat their service pensionable for a considerable period leaves them with very meagre pension and in some cases with no pension. This is against the principle of social justice and therefore our above suggestion should be considered by the 7th CPC. 3.5 Pensionable service of Casual and GDS: Recent judicial pronouncements have directed the Government to take into account the date of entry in the service as a casual labourer or a temporary status Majdoors etc into criterion and not the date of regularisation to determine as to whether he or she is to be brought under the CCS (Pension) Rules, 1972 or under the NPS. Therefore we propose that all casual labourers, Gramin Dak Sewaks in the Department of Posts etc are to be brought under the Defined Benefit Pension Scheme under the CCS (Pension) Rules, 1972 for grant of pension on their regularisation in the services, even though they are getting regularisation after 1.1.2004 because they should be treated as having entered the services before 1.1.2004 as per the judgment of Court. We therefore propose that entire service rendered as a casual labour irrespective of the fact whether he was granted temporary status or ultimately regularised should be treated as pensionable service and the service rendered as GDS in Department of Posts also should be treated in the similar fashion. 3.6 Interruption causing forfeiture of service for pension: The existing provisions defining interruptions in service causing forfeiture of past service for purposes of pension are quite antiquated, unnecessary and unreasonably harsh, which should be removed from the statue book. In formative years when the British Authorities were recruiting Indians in their Administrative Services, it was noticed that during sowing and harvesting seasons, a large number of employees used to go back to the fields without any regular leave etc. As a deterrent, the rules regarding interruption in service had been legislated then. Since most of the employees have now lost their rural roots, such frequent and recurring interruptions are no longer there. Interruption as and when rarely caused is due to reason mostly beyond the control of an employee. We therefore, propose that instead of treating interruption to cause an automatic forfeiture of past service for pensions, it should be dealt with under CCA Rules. The provision causing forfeiture of service for pension purposes on account of interruption may, therefore, be deleted. Even 5th CPC in Para 133.79 had recommended that terminal gratuity at different rates be paid to those who resign after putting in certain years of service and resignation after 20 years of service may be treated as voluntary retirement and pension may be paid accordingly. We, therefore, request the 7th CPC that the above recommendation may be reiterated. 3.8 There are certain employees who are in the CPF Scheme but could not opt for the Pension Scheme in the year 1986. These are mostly women employees employed in Atomic Energy Commission etc who could not make up their mind as to whether they could render the requisite number of service necessary for grant of full pension. In certain autonomous bodies while options for Pension scheme have been obtained, this is not being granted. They may now be allowed to revise their option. Our suggestion is that CPF / SRPF retirees may be granted Minimum Pension. 3.9 The VI CPC has done away with the requirement of 33 years of qualifying service for full pension. They have said that full pension may be granted to those who have the qualifying service of 20 years. Therefore we have no further suggestion to place before the Commission on this issue. (ii) At a standard equivalent at the pre-retirement level. 3.11 Therefore taking into account that on superannuation an employee is left with a „two unit family‟ generally and therefore if he is to be enabled to maintain a standard equivalent to the pre-retirement level, the rate of pension should be 67% of the last pay drawn. We therefore suggest that full pension should be at the rate of 67% of Last Pay Drawn or 10 months average emoluments, whichever is more beneficial. 3.12. It is pertinent to point out that several countries in the world pay higher rate of pension to their civilian pensioners. France is paying 75% of last six months average emoluments as pension; Belgium is paying 75% of last five years average as pension; Cyprus is paying 67% of final salary as pension; Malta is paying 80% of average of best 15 years wages as pension; Our neighbour Sri Lanka which is also in the lower middle income group of countries like India in South Asia, is having a scheme called "Public Servants Pension Scheme (Defined Benefit Scheme) established in 1901, as a mandatory scheme financed by the Government budget is paying 85% to 90% (for 30 years of service) of last one year annual salary at retirement as pension (Source: Sri Lanka Pension Department Circular No.3/2004 dated 16.01.2004); The life expectancy in Sri Lanka at 60 is 20.2% which is 3.5% higher than India. "Number of years of service X Last Basic Pay X 7 and divided by 300. If an employee has served 35 years of service and received last basic pay as Rs.10,000/- then that employee shall get a pension of 8.167/- (i.e., 81.67%). 3.14 In Bangladesh the retirement age is 57. The life expectancy at 60 in Bangladesh is 17.9 which is same as in India. This country also remains in lower middle income group of countries like India. But Bangladesh pays 80% of last pay as pension. In the war devastated country of Afghanistan,, pension is calculated on last 36 months average; for each year it is 2% and a maximum of 80% is given as pension in that country. 3.15 From the above comparison with some of the world countries of both European as well as our own South Asian countries, it is clear that all those countries are paying better percentage of pension to their Civilian employees. India appears to be one of the less pension paying country despite its image of one of the faster developing economies in the world. We therefore suggest that the basic pension to be determined should be 67% at least on the basis of the last pay drawn or the 10 months average emoluments, whichever is more beneficial to employee subject to the condition that the pension so determined shall not be less than the minimum of the pay scale of the post held by him at the time of his retirement. (i) Pension Revision of BSNL pensioners should be made mandatory when ever wage revision is implemented in BSNL. Before the formation of BSNL on 01-10-2000, Rule 37-A was incorporated to the CCS (Pension) Rules, 1972 to ensure pension to the BSNL absorbed DOT employees from the Consolidated Fund of Government of India. Subsequently, this position was ratified by the Secretary, Department of Telecom vide his DO letter dated 15-05-2005.,that in respect of employees who have been absorbed in BSNL,BSNL is liable to pay the pension contribution in accordance with FR 116 and liability on account of pension payable will be that of government of India. Surprisingly, DOT issued another letter on 15th June,2006,reversing its earlier decision and linked payment of pension with receipt of revenues from BSNL. This, being most dangerous and certain to create problem in future for payment of pension, the unions took up the issue seriously and the DOT was compelled to issue another letter stating that the contents of the letter dated 15-06-2005 will not be insisted. But in the absence of cancellation/nullification of the controversial letter dated 15-06-2006, when ever the pension revision issue of BSNL pensioners is initiated, hindrances/road blocks are raised not only by DOT, but also by other departments like Expenditure, Law and Public Enterprises,on the basis of the above letter. This has happened when pension revision of pre 2007 BSNL pensioners was initiated and now for pension revision on 78.2% IDA merger.This position should not be allowed to continue and the BSNL pensioners should be treated at par with central government pensioners, as they are covered under rule 37-A of CCS(Pension) Rules,1972. Therefore pension and pension revision should be granted to BSNL pensioners irrespective of the payments made by BSNL. (ii) Other benefits granted to BSNL employees from time to time should be granted to the BSNL pensioners also. (iii) All the pensionary benefits,that may be granted to the central government pensioners based on the recommendations of the 7th Central Pay Commission should be extended to the BSNL pensioners as in the case of 6th Pay Commission recommendations. 3.16 It has already been well recognised that as the age after superannuation further advances, not only the pensioner becomes weak in limbs but also becomes more susceptible to various geriatric diseases. He will have to incur additional expenses for his upkeep. There are also the social obligations and increased expenses on medical treatment etc. 3.17 The Government of India has accepted and implemented the 6th CPC recommendation of age-related additional pension beyond the age of 80. However the 6th CPC did not recommend any addition to the pension for a period of 20 years after superannuation at the age of 60. Their argument was that every pensioner gets increase in his / her pension after 15 years when the commutated portion of his pension is restored. This is not at all a valid ground. Even during these 15 years the Dearness Relief is calculated on his gross pension and not on his net pension after commutation and he earns interest on commuted value of pension. Therefore there is no increase in pension on account of restoration of commuted pension after 15 years. 3.18 In our opinion this needs certain revision. According to SSO survey (2007- 08) 7.5% population only is above the age of 60. Naturally this may reflect among the pensioners also. Life expectancy at 60 is only 17.9 and at 70 it is only 11.8 (Source: Sample Registration System O/o the Registrar General India). This means a Government servant is receiving pension for 18 to 22 years. In the age group of 60 to 79, in Rural areas 5% and in Urban areas 5.5% is confined to bed. In the same age group 22.4% in Rural areas and 20.2% in Urban areas is confined to home due to physical immobility (Source: National Sample Survey, 60th Round, 2004). After retirement, their income from pension is nearly 1/3rd of their gross salary at the time of retirement. But they have to spend more on medical care. This age-group therefore also needs some relief by way of additional pension. Incidentally Afghanistan which is one of the low income countries in Asia, is having a retirement age of 65 with a formula of grant of additional pension at the rate of 3% for each year after 65 years of age and the maximum 80% additional pension is paid. 3.19 Therefore we seek the 7th CPC to consider addition to the pension after granting 67% of last pay drawn (LPD) / Average of emoluments as full pension on superannuation at 60 years of age as under, because of prevailing life expectancy of Indian Citizen Age is 69.6 (assessed during the year 2011-15) and the old pensioner who is also considered to be senior citizen has to wait for a period of twenty years on his retirement to get an increase at his age of 80 maintaining his health from disease burden. 3.20 Though the concept of minimum pension and the method of computing it have not been explained by any of the pay commissions or the Government, it is clear that the Minimum Pension is 50% of the Minimum Wage. The rationale behind the percentage has nowhere been explained. We however think that in order to ensure that it is adequate, 100% of the minimum wage should be the Minimum Pension. The very concept of Need Based Minimum Wage is that this is a level of wage below which a worker's family cannot subsist / survive and remain capable to perform. That being the concept of minimum wage, it should also apply in the case of Minimum Pension on the premise that any pension lower than the Minimum pay is insufficient to enable a pensioner / family pensioner to live or survive. 3.21 We have no suggestions for improvement of this issue except that Pensioners may be paid the same dearness compensation viz., at the same rate as it is being paid to the serving employees. It should be periodically merged with the basic pension so that deficiency in the 100% neutralization in the cost of living is partially compensated. 3.22 As on 01.01.2014, the Dearness Relief compensation stands at 100%. The suggestion for merger of DR to partially compensate the erosion in the real pension was first suggested by the Gadgil Committee in the post 2nd Central Pay Commission period. The 3rd CPC had recommended such merger when the cost of Living Index crossed over 272 points i.e. 72 points over and above the base index adopted for the pension revision. In other words, the recommendation of the 3rd CPC was to merge the Dearness Relief when it crossed 36%. The Government in the National Council JCM at the time of negotiation initially agreed to merge 60 % Dearness Relief and later the whole of the DR before the 4th CPC was set up. The 5th CPC merged 98% of DR with pension. 3.23 The methodology adopted for compensating the erosion in the real value of pension in the interregnum period had always been through the mechanism of merger of a portion of Dearness Relief. The 5th CPC had recommended that the Dearness Relief must be merged with basic pension as and when the percentage of Dearness compensation exceeds 50% accordingly even before the setting up the 6th CPC the Dearness Relief to the extent of 50% was merged with pension. 3.24 It was totally ironic to note that deviating from all other Pay Commissions, the 6th CPC had made a reversal and recommended that no Dearness Allowance / Dearness Relief should be merged with the Basic Pay of employees / Basic Pension of Pensioners. The recommendation had dealt a severe blow below the belt as this recommendation denied everyone from having any cushion against the erosion caused in the real value of pension in between two pay commissions. Had the recommendation of V CPC been continued, there would have been two automatic mergers of Dearness Relief by this time as V CPC recommended such a merger automatically whenever the dearness relief index crosses 50% mark. 3.25 The Central Government also taking undue advantage out of the recommendations in the name of 6th CPC has been stiffly denying any such merger of DA/ DR. This issue requires course correction and we suggest that the 7th CPC should recommend for automatic merger of DA / DR as and when the index crosses the 50% mark and before setting up another Pay Commission entire DA should be merged with pay as was done by the V-CPC. 3.26 In Memorandum submitted by and on behalf of Staff Side of National Council (JCM) on the above issue, 25% of basic pension as Interim Relief for Pensioners and G D S of Postal Department has been demanded. VII CPC may consider this demand and give an Interim Report to the Government recommending that 25% of basic pension may be granted to all pensioners w.e.f. September 2013 when the Government had announced the seting up of 7th Central Pay Commission. 3.27 We submit that there should be a system of periodical revision of pay / pension structure in Public Sector takes place after every five years. Pay and Pension structure which should also be revised after every five year. Present wage structure is based upon minimum which is lower than Need based Minimum only through periodical revision it may be attaining the fair wage and finally to living wage standard. Under Article 43 of the Constitution, State has to endeavour to secure living wage to all workers. And this is possible over a period of time. It is on these considerations that revision of wage / pension has to be done every five year till the living wage standard is achieved. 4.1 The Government have recently announced that "One Rank One Pension" shall be implemented in respect of Armed Forces so that the glaring disparity between the persons of equivalent rank and status do not draw vastly unequal pensions if they retire at different point of time is undone. Already there is a complete parity in pension among the Judges of Supreme Court, High Court and the Comptroller and Auditor General of India, irrespective of the date of their retirement. 4.2 In so far as the Civilian Employees are concerned the principle of parity in pension between the past and the future pensioners was implemented by the Government as had been recommended by the V CPC. The V CPC recommended that "as a follow up of our basic objective of parity we would recommend that the pension of all pre-1986 retirees may be updated by notional fixation of pay as on 1.1.1986 by adopting the same formula (Revised Pay Rules) as far as the serving employees. This step would bring all the past pensioners to a common platform on to the 4th CPC pay scales as on 1.1.1986. Thereafter, all pensioners who have been brought on the 4th CPC pay scales by notional fixation of pay and those who have retired on or after 1.1.1986 can be treated alike in regard to consolidation of their pension as on 1.1.1996 by allowing the same fitment weightage as may be allowed to the serving employees". They further recommended that "the consolidated pension shall not be less than 50% of the minimum pay of the post as revised by the CPC held by the pensioner at the time of retirement". The V CPC further said that "this attainment of reasonable parity needs to be continued so as to achieve complete parity over a period of time". However the VI CPC totally ignored these recommendations of the V CPC and has reintroduced the element of disparity by not adopting the same formula for post 1996 retirees, and by not recommending the same fitment benefit and other recommendations liberalising the pension rules in respect of pre-2006 retirees. Thus a huge disparity between pre-2006 and post-2006 retirees has been created by the VI CPC. 4.3 We therefore urge that pay of every pre-2014 retiree should be notionally redetermined (corresponding to the post from which he or she retired and not corresponding to the scale from which he or she retired) as if he or she is not retired and then the pension be computed under the revised liberalised rules which are to be applicable to the post-2014 retirees under the same rules which would be applicable to employees in service as on 1.1.2014. 5.1 At present the family pension is given at the rate of 30% of Pay last drawn. However, family pension shall be equal to 50% (67% as proposed by us) of pay last drawn or twice the rates given above, whichever is less and the amount so admissible shall be payable from the date following the date of death of the Government Servant for period of 7 years or for a period up to the date on which the deceased Government Servant would have attained the age of 67 years had he survived / 10 years in case of death in harness. The family pension is not less than Minimum Pension. 5.2 The above Rule is applicable to a Government Servant who is not governed by Workman Compensation Act, 1923, if he dies while in service, after having rendered not less than 7 years of continuous service. (i) In the case of a widow or widower, up to the date of death or remarriage whichever is earlier. (ii) In the case of a Son until he attains the age of 25 years. (iii) The unmarried / widowed / divorced daughter. (iii) The disabled mentally retarded child of the Government Servant. (a) "Though Unions and Pensioners' Associations demanded enhanced Family Pension for 10 years in the case of death of both employees and pensioners, the VI CPC recommended enhanced family pension for ten years in the case of death in harness only stating that a special dispensation is justified for them( Para-5.1.42 )and the government accepted /implemented the same, thereby dividing a single class of Family Pensioners. Earlier to it was for 7 years subject to ceiling of 58+7=65, which was later altered to 60+7=67 years on change of retirement age in the case of death of both employees as well as pensioners uniformly. As the enhanced Family Pension on the death of the Head of the family is intended for the family to stabilize the sudden drop in the take home pay/pension and as the distress due to loss of bread winner, the enhanced Family Pension and the financial insufficiency are the same whether it is the death in harness or pensioner's death, it is felt that the introduction of a different enhanced period for death in harness alone amounts to unfair labour practice. As the distress, financial crunch and sentimental depression are more or less the same , we feel strongly that there is no need to differentiate between the two 'distress situations'.The Commission is requested to recommend removal of this disparity to enable grant of enhanced family pension uniformly in both the cases for 10 years keeping in view the principle of social justice , equity and fair play. (b) The quantum of family pension for the period of 10 years should be equal to the pension of the Government Servant was entitled as per Rules. (c) After the expiry of the above 10 years period, the family pension may be reduced to 75% of full pension or 50% of last pay drawn whichever is higher. (d) In case of a Son, the family pension may be allowed up to the age of 28 years. This is suggested because the recruitment age has been raised in certain cases to 28 years. (e) The concession extended to a disabled mentally retarded child to receive family pension until his / her death is subject to the condition that the said disability should have manifested before the death of Government employee. We suggest that this condition may be removed. (a) Full notional pension / Minimum pension during first 10 years after his death. (b) 75% of the above or Minimum pension, whichever is higher, thereafter. "II – Cases of disability (100%) resulting in discharge from service"
"Normal pension and gratuity admissible under CCS (Pension) Rules, 1972, without insisting on the requirement of minimum service of ten years plus Disability Pension equal to the normal Family Pension, i.e., 30% (as per our proposal 50%) of the basic pay". "III – Disability Pension – for cases covered under categories „B‟ and „C‟. "(1) Normal pension and gratuity admissible under the CCS (Pension) Rules, 1972 plus – Disability Pension equal to 30% of basic pay for 100% disability." This has resulted in a Group „D‟ employee with 6 years‟ service, who has been invalidated (with 45% disability) and boarded out of service not getting the minimum pension towards "Service element". This injustice is required to be set right. 5.9. Extension of Family Pension Under CCS (Pension) rule, 1972 to CPSU absorbees who were compulsorily covered by the "Employees Family Pension Scheme, 1971 on their absorption in Centyral Public Sector undertaking and to those absorbees who were not eligible for family pension since they were drawing more pay than the prescribed limit for eligibility under the scheme. Central Government employees who were on deputation to Central Public Sector Undertaking / Autonomouns Bodies (AB) and who were subsequently permanently absorbed in the CPSU / AB were compulsorily covered by the 'Employees Family Pension Scheme, 1971 framed under the Employees Provident Funds and Miscellaneous Provisions Act, 1952 (Administred by the Provident fund Commissioners), if the said scheme was in operation in the CPSU / AB in which the Central Government employees was absorbed. And such of those absorbees who were drawing more pay then the prescribed limit under the scheme not for family pension under EFPS – 1971. Government of India , Department of Pension & Pensioners Welfare vide its O.M No. 1-18/86-P&PW (D) dated January, 1990 accepting the request of the Staff Side in the 29th ordinary meeting of the National Council (JCM), revised the family pension entitlement of the absorbed employees and allowed them an option to choose either Family Pension Scheme of the Central Government (i.e. CCS (Pension) Rules) or by that of the CPSUs /Abs (ie Employees Family Pension Scheme, 1971). These modifications to family pension entitlements of absorbees were given effect to from the date of issue of the O.M. ie 22.1.1990 and were extended to only such of those absorbed employees who were in service on the said date and who were permanent and had a qualifying service of not less than 10 years in the Government. all other absorbees were compulsorily covered by the Employees Family Pension Schem, 1971. As a result of the above, there are now 3 categories of retired CPSU Absorbees. (1) Absorbees eligible for family pension under Employees family pension scheme, 1971, (2) Absorbees who are eligible for family pension under CCS (Pension Rules, 1972 and (3) Absorbees who are not eligible for family pension under any Scheme. The VII Central Pay Commission is requested to recommend removed of the disparity existing between the 3 categories of CPSU Absorbees stated above by extending the provisions of CCS (Pension) Rules, 1972 to all the Absorbees uniformly making them eligible for family pension. 6.2 We suggest that the gratuity may be calculated on the basis of 25 effective days as against 30 days in a month. We make this suggestion because the Government Servant should not be paid at a rate lesser than what is admissible under the Gratuity Act. 6.3 The ceiling of 16.5 times should also be removed. This is because under existing rules gratuity is reduced in the case of a Government Servant who has put in less than 33 years of service. In the banking industry there is no such ceiling of 16.5 months‟ salary but the retiring bank employees are getting at the rate of ½ a month salary for every year of service even over and above 33 years of service. Therefore, it is but logical that for a service span exceeding 33 years, the gratuity should be higher and the above ceiling be withdrawn. 6.4 Central Government employees are permitted to commute up to 40% of their basic pension. We have no suggestion to make in this regard. 6.5 In the light of Supreme Court decision, commuted value of pension is restored on completion of 15 years or on reaching 75 years of age whichever is later. Most of the State Governments are restoring full pension after 12 years or on reaching 70 years of age. We, therefore, propose that full pension be restored after 12 years, or on reaching the age of 72 years, whichever is earlier. From the table given below it will be seen that the entire commuted value gets repaid to the Government by the Pensioners within 12 years. 6.6 Now when the commutation factor has been reduced and is applicable after 2008, the restoration of commuted pension should be after 10 years. It will be seen that entire commuted value gets repaid within 10 years as could be clear from the table given below. 6.7 Taking all these factors into account, we suggest that the commuted pension may be restored on completion of 10 years or reaching the age of 70 years, whichever is earlier. "the right to health to a worker is an integral facet of meaningful right to life to have not only a meaningful existence but also robust health and vigour. Therefore, the right to health, medical aid to protect the health and vigour of a worker while in service or post retirement is a fundamental right-to make life of a worker meaningful and purposeful with dignity of person. Thus health care is not only a welfare measure but is a Fundamental Right". We suggest that, all the pensioners, irrespective of pre-retiral class and status, be treated as same category of citizens and the same homogenous group. There should be no class or category based discrimination and all must be provided Health care services at par. We also request the commission to recommend to govt. to make preventive health care an essential ingredient of all health care schemes for retired Persons. CGHS and RELHS should be expanded and improved also CSMA Rules 1944 be extended to pensioners residing outside CGHS Area. 7.2 Nursing Homes / All India Private Hospitals / Diagnostic Centres to cater for the CGHS beneficiaries should be increased in such a way that they will be nearer to the residence cluster of the beneficiaries. While selecting great care should be taken that no beneficiary is required to travel more than 2.5 KMs to obtain treatment. In Delhi, the recent approval for hospitals has been done without keeping the distance of beneficiaries residence localities. Some areas have been completely forgotten and some points have been given more than one referrals. This appears well on paper and satisfies the Ministry but in practical terms it is more a punishment for the beneficiaries. 7.3 We wish to invite attention of 7th CPC to the recommendation made by the V CPC as detailed in Para 140.11 of their report regarding extension of CGHS. Unfortunately, the well intentioned recommendation has remained still as recommendation only. Under some plea or the other, there had been practically no expansion whatsoever in this regard, which is regrettable. A number of proposals had been forwarded to the government by the many pensioners Associations but have been kept in cold storage. The 7th CPC is requested to reiterate this important recommendation, suggesting opening of new CGHS dispensaries as per prescribed norms securing clearance from Planning Commission, wherever necessary. Smart Cards to Pensioners: Smart Cards may be issued to all Pensioners from all Department (including Postal Pensioners) and their dependents for cashless and hassle less medical facilities across the country in all Government hospitals; all NABH accredited Multi Super Speciality Hospitals which have been allotted land at concessional rates or given any other aid or concession by any Government; all CGHS, RELHS and ECHS empanelled Hospitals. · No referral should be insisted in case of medical emergencies. For the purpose of reference for hospitalization & reimbursement of expenditure thereon other than in emergency cases Doctors/Medical officers working in different Central/State Govt. department dispensaries/health units should be recognized as Authorized Medical Attendant. 7.5 Discrimination to P&T Pensioners: The Central Government Pensioners, whether they were beneficiaries or not while in service, are permitted to join CGHS on retirement. However the Ministry of Health & FW had issued an order dated 1.8.1996 according to which all P&T Pensioners who were not participating in CGHS while in service have been debarred. This in itself is a very grave discrimination, which is not permissible under Article 14 of the Constitution. This was therefore challenged in Courts and the latest position achieved is that the Courts have held that the P&T Pensioners may be permitted to participate in CGHS or alternatively covered under CS (MA) Rules, 1944. 7.6 Postal Dispensaries: In the meantime, following the recommendations of the V CPC and VI CPC, 19 P&T Dispensaries in 12 CGHS Cities have been merged with the CGHS. Instead of now allowing all P&T pensioners irrespective of the station they live, only those who are living in these 12 Cities have been allowed to participate in the CGHS. This is also discriminative because all other Central Pensioners are permitted to join CGHS irrespective of the fact where they are living. It is therefore urged that the 7th CPC should recommend that the above discrimination is put an end to and all P&T Pensioners may be allowed to participate in CGHS. 7.7 The Department of Post running its Postal (formerly P&T) dispensaries in 45 cities for outdoor treatment to its working and retired employees. Out of them 19 dispensaries in 12 cities have been merged with CGHS where CGHS and Postal dispensaries co-existed, by Ministry of Health & Family Welfare vide Notification dated 9.7.2013. Now there remains 33 dispensaries in cities namely, Vadodara, Agra, Moradabad, Saharanpur, Varansi, Gorakhpur, Aligarh, Bareilly, Behrampur, Cuttack, Siliguri, Jalpaiguri, Trichurapalli, Triunelveli, Ambala, Silchar, Dibrugarh, Guntur, Nellore, Rajmundri, Vijayawada, Vishakhapatnam, Ajmer, Jodhpur, Kota, Dhanbad, Gaya, Muzzafarpur, Chapra, Raipur, Amritsar and Jallandhar. In fact in these Postal Dispensaries only outdoor treatment is given for serving and retired employees, but for working employees indoor medical is given through either CS (MA) Rules or by authorizing private hospitals like CGHS, (NO INDOOR FOR RETIRED EMPLOYEES). From working employees no contribution is realized whereas yearly contribution is realized from pensioners, on the other hand, in CGHS there is no such discrimination between and retired employees with regard to treatment and contribution both. IT IS BE NOTED THAT CGHS AND POSTAL DISPENSARIES BOTH WERE FORMED UNDER THE CS (MA) RULES, THEN WHY THIS DISCRIMINATION EXISTS BETWEEN CGHS AND POSTAL DISPENSARIEAS. The department of Posts is required to amend its rules / instructions, so that the facilities / contribution is made available to pensioners at per working employees alike CGHS. The VII CPC may kindly consider the above state of discrimination between serving Postal employees and Pensioners and recommend that Postal Pensioners may also be provided indoor treatment under CS (MA) Rules. 7.8 Hospital Regulatory Authority: We suggest that a Hospital Regulatory Authority shall be set up to ensure that the hospitals provide reasonable care to Smart Card holders. This Authority can undertake periodical revision of CGHS approved rates for several kinds of medical treatment as well as for lab tests in consonance with the prevailing market conditions so that no crisis develops like refusal of treatment by empanelled hospitals. 7.9 Fixed Medical Allowance: The Government fixed the rate of FMA as 300/- per month to the Pensioners not covered under CGHS etc. Several appeals for revision of this amount in a realistic manner to suite the conditions prevailing on counts like Doctor‟s fees, cost of medicines, rate of lab tests etc went in vain as the Government stoutly refused to enhance this FMA in a reasonable manner. It can be seen that the Employees Provident Fund Organisation under the Central Government's Ministry of Labour was paying a monthly FMA to its employees at the rate of 1200/- prior to 6thCPC when the other Central Government employees were drawing only 100/- per month. The same EPF Organisation came forward to enhance the said FMA from 1200/- to 2000/- per month w.e.f. 1st March, 2013 for the serving employees, EPF pensioners and family pensioners. When an organisation under the same Central Government has taken steps to suitably enhance the Fixed Medical Allowance in consonance with the market conditions, there is no justification whatsoever for the Central Government to adamantly refuse to keep this FMA at a lowest level of Rs.300/- per month which everyone knows is totally inadequate to the medical needs of a pensioner's family. When pressed the Government have stated that as this allowance was introduced by the V CPC, the enhancement of its rates will have to be considered and recommended by another pay commission. We suggest that the 7th CPC recommend for refixation of FMA @ 2000/- per month plus DA thereon. In addition this FMA shall be permitted to those pensioners who want to undergo only Unani or Ayurveda or Homeopathy type of treatments even though they live in areas covered by CGHS. 7.10 CS (MA) Rules 1944: In the interregnum period of permitting all pensioners into the CGHS without any discrimination, the CSMA Rules, 1944 should be extended to pensioners living in non-CGHS areas and stations, which are at present not covered by CGHS. As recommended by V CPC, vide Para 140.18 of their report, benefit of CS (MA) Rules, 1944 should be extended to pensioners in non-CGHS areas at least to the extent of full reimbursement of expenses incurred for hospitalization in a Government hospital or hospitals recognized under CS (MA) Rules for the serving employees or those hospitals recognised by State Governments for such purposes for their employees. To cite examples, in the City of Mysore, a number of hospitals have been recognized under CS (MA) Rules, 1944 for serving Central Government employees. But Pensioners cannot avail the benefit merely because there is no CGHS dispensary there. Similarly, in Udupi though the world-famous "Kasturba Hospital" is recognised under CS (MA) Rules, 1944 for serving employees, the Pensioners do not get the benefit merely because there is also no CGHS dispensary available. "The benefit of the liberalised orders bearing No. OM No.S-11011/7/99-CGHS(P) dated 27-4-20110f the MoH&FW can not be availed by all pensioners living in non-CGHS areas as the order pre supposes possession of a CGHS card by such pensioners. 7.11 Several cases of claims for reimbursement of medical expenses incurred by pensioners living in non-CGHS areas have been decided in favour of pensioners by the CATs and even the High Court of Gujrat at Ahmedabad. "All the SLPs ( 34 in all ) filed by the government of India in this connection have been dismissed by the Supreme court of India on 3-4-2012 and Government of India had to issue orders directing all concerned to allow reimbursement of the medical claims of pensioners concerned living in non-CGHS areas /Stations.7th CPC is therefore requested to make suitable recommendation in this regard in order that even if CGHS dispensaries are not opened, for whatever reasons they may be, the Central Government pensioners may avail medical in-patient facilities (in hospitals recognized under CS (MA) Rules, 1944 for serving employees) and get reimbursement of expenses from the departments to which they belong. 7.12 It is a fact that ESIC medical scheme caters for more than 35 millions of beneficiaries in the private factory employment sector. If the ESI System with a network of 144 hospitals, 42 Annexes, 1400 dispensaries and tie up with 2041 private medical practitioners besides with a large number of Super Specialty Hospitals can provide medicare, why should not CGHS / CSMA cater for the medicare needs of more than 40 lakhs of employees and more than 30 lakh of pensioners spread all over the country like the ESIC beneficiaries? The 7th CPC may kindly examine the feasibility of improving the present CGHS / CSMA formats to ensure Medicare to all Central Government employees and Pensioners. There is no need absolutely to scout for alternate method. The recommendation of the 5th CPC for suitably amending CS (MA) Rules, 1944 for providing indoor medical attention to a very small segment of Central Government Pensioners residing in non-CGHS areas should not pose any insurmountable hurdles. It is fortunate that the nodal Ministry viz., Ministry of Health and Family Welfare, has accepted the need for Medicare to 60 plus retired personnel that they should not be deprived of the medicare and the Judiciary have taken cognizance of this principle, there should be no hesitation in amending the CS(MA)Rules, 1944 for providing in-door attention to the retired employees. 8.1 Pension and Dearness Relief and Fixed Medical Allowance to be net of Income Tax. The purchase value of pension gets reduced day by day due to continuous high inflation and steep rise in cost of food items and medical facilities. Retired persons / Senior citizens do not enjoy fully public goods and service provided by Government for citizens due to lack of mobility and many other factors. Their ability to pay tax reduced from year to year after retirement due to ever-increasing expenditure on food, medicines and other incidentals. Their net worth at year end gets reduced considerably compared to the beginning of the year. Inflation, for a pensioner is much more than any tax. It erodes the major part of the already inadequate pension. To enable pensioners, at the fag end of their lives, to live in minimum comfort and to cater for ever rising cost of living, they may be spared from paying Income Tax on Pension and the DR – as recommended by 5th Pay Commission in para 167.11 of their report. 8.2 Housing: Central Government employees in occupation of Government Staff Quarters on retirement are constrained to hire private accommodation at exorbitant and prohibitive rental. They are per force to spend a sizable portion of the pension on rent alone. While in services, though they are entitled to get house building advance etc, most of them are unable to avail the facility and construct house for the salary income they earn is incapable of making the both ends meet. It is therefore necessary that a provision is made for reserving a percentage of the number of residential units constructed by the State / Central Housing Boards and Corporations, for outright purchase of allotment on instalment basis to pensioners. We therefore suggest that 10% of the total units constructed by the State Housing Boards, Central Housing Corporations etc to be reserved for pensioners. Similarly quite a number of staff quarters sometimes lie vacant without occupation by serving employees and such quarters may be allotted for pensioners on payment of just licence fee only. In addition, dormitory type single room tenements with common dining hall, library, cultural centre, auditorium, basic medical facility etc may be constructed at the outskirts of the cities and allotted to pensioners on payment of a reasonable amount. Until such schemes are accepted and worked out, HRA may be granted to the Pensioners on the same rates as is given to serving employees. 8.3 Travel Concession: Senior Citizens on attaining the age of 60 years (Males) and 58 years (females) are given fare concession in Railway travel at the rate of 40% and 50% respectively. We suggest that retired Government Servants may be allowed the facility of travel concession once in 2 years to any place inside India from their place of their residence. We point out that the purpose of granting LTC to serving employees has an in-built advantage of encouraging tourism development, which is helpful to the economy in several ways. Similarly any travel concession granted to Pensioners will also boost the tourism development in the country besides bringing happiness at their old age. After retirement, most of the pensioners spend the time on spiritual activities. They like to visit important religious places in the country. The Commission's attention is drawn to the fact that Government of Punjab is granting Travel Concession to all its pensioners by paying one month's Basic Pension for every block of 2 years. It was introduced from 1/1/1989 and the payment is made in January every two years (Source: Punjab Government letter No.1/15/89-IFP-II/8078 dated 31/8/1989). In the past 25 years the cost of everything has gone up. The Commission is requested to recommend to the Government to pay 3 months Basic Pension as Travel concession and the facility may be extended once in 2 years to all those pensioners/Family Pensioners including family Pensioners other than spouse, who are at present not getting travel facilities as departmental advantage. 8.4 In the last decade, the social fabric has undergone a drastic change. The Indian Parliament had to enact a law for the kith and kin to look after their parents. After the death of a pensioner, cremation/burial has to take place in an honorable manner. Each religion has got its own custom and rituals and the cost is very high. It is to be noted that Andhra Pradesh Government is granting an amount of Rs.10,000/- as 'Death Relief' to its pensioners, Family pensioners (Source: AP Govt. G.O. MS.No.102 Finance (Pen.I) Department dated 6/4/2010 & G.O. M.S. No.136 dated 29/6/2011). The Commission is requested to recommend an amount of Rs.10,000/- as 'Death Relief' in the event of death of pensioner, pensioner's spouse or Family Pensioner. 8.5 Family Security Fund: The family of the Pensioner shall be granted a lump sum of 1,00,000 on the death of the Pensioner by introducing a scheme for Family Security Fund with the arrangement for contribution by the pensioners. At present such scheme is in existence in states like Tamilnadu, where the Pensioner is contributing a monthly contribution of 80/- and in the event of his / her death, the spouse is given a sum of Rs.50,000 as family security fund. Therefore the 7th CPC is requested to examine this proposal for framing such a scheme for facilitating payment of at least 1,00,000 rupees on the demise of the pensioners to their spouses. "The OM No. 44013/2/2010-Coord dated 25-3-2011 issued by the Department of Pension & Pensioners' Welfare is required to be amended suitably. federations, associations, organisations in the country like mushroom growth and there is no orderliness amongst them and each and every pensioner organisation is raising its own demands. There is no orderliness in this system. Therefore, we suggest, that the VII CPC may recommend to the Government to upgrade the status of the SCOVA like the other forum of National Council JCM with separate Rules framed for granting recognition to Pensioners Organisations to give them representation in the SCOVA. All the All India Pensioners Associations/Federations may be accorded recognition & extended such facilities as have been granted to the serving employees Association/Unions/Federations. The SCOVA may be renamed as Joint National Council of Pensioners Organisations. It should be a two tier system one at National level and other Departmental Level. Dearness ex-gratia as above is reckoned before applying dearness relief. c) These amounts are utterly inadequate even for hand to mouth living in the resent scenario of high cost of living and spiraling inflation. Request were earlier made to grant one more pension – option to the surviving CPF/SRPF (C) retirees or to grant them 1/3 rd pension as given to PSU absorbees, but the same have not been agreed to. Period for service for granting ex-gratia in their cases should be brought down to 10 ears as in the case of eligibility for pension. They should be granted one time option for pension as recommended by the IV CPC . Minimum ex-gratia to the beneficiary well as the family should be equivalent to minimum pension / family pension of the grade in which they retired as revised from to time. It need to be appreciated that they also had rendered satisfactory service to the government. they worked in more arduous circumstances when the country was relatively undeveloped with low salaries, incremental rates and promotional avenue. They and their families should not be condemned with low rates of ex-gratia and denial of several benefits extended to pensioners / family pensioners for error of judgment on their part in not opting for pension when options were extended because of their inability to foresee the development of the country and the vast changes that have been taking place after their retirement. They are a fast disappearing category and grant of full benefits on par with pensioners will not cause any undue financial burden to the government. in addition to revision of ex-gratia rates on par with pensions and family pensions, they have also to be extended benefits such as same rates of DR granted from to time, ex-gratia to their dependent unmarried / widowed / divorced daughter above 25 years of age, fixed medical allowance, widow passes to the families of deceased SRPF beneficiaries etc. India is a welfare state and the discrimination going on against them all these years is against the very letter and spirit of constitution of India and the concept of welfare state embedded in the directive principles of state policy. Family pension under CCs (Pension) Rules, 1972 is being paid to eligible widowed / divorced / unmarried daughtersbeyond the age of 25 years for life if they continue to be eligible for payment of family pension. But in respect of the dependent widowed / divorced / unmarried daughters of CPF / SRPF beneficiaries, payment of family pension is stopped when they complete the age of 25 years. Hence it is requested that the VII CPC my please recommend extension of the benefit admissible to the above category of Central family pensioners to the dependent of CPF / SRPF beneficiaries also. Discussing and deciding the matters relating to Pensioners, with representatives other than those of pensioners, is unfair & against the Rules of 'Natural Justice'. At present various Committees like National Anomaly Committee (NAC) and JCM (on Pensioner matters), are there, wherein matters / policies relating to pensioners' welfare are discussed and decided, but they do not have pensioners' representatives with the result their viewpoints, hardships & anomalies are not properly represented. As pensioners are a homogenous class, there is an urgent need to constitute separate Committees for pensioners wherein matters / policies / anomalies relating to pensioners of all Groups, categories & departments may be discussed. 8.11. Lingering Litigation on Pensioners matters due to uncalled for Appeals by Government: Govt. should not indirectly pressurize courts by appealing again & again to get judgments reversed in its favor & must implement all court judgments in case of all similarly placed persons. Fifth CPC recommended in para 126.5 that any Court Judgment involving a common policy matter of pay/pension to a group of employees/pensioners, should be extended automatically to similarly placed employees/pensioners without driving every affected individual to the Courts of law. This recommendation is never followed by GOI, with the result Pensioners in the evening of their life, are forced to approach the legal forums, seeking the same relief. This in turn, bulges court dockets. The Commission is requested to recommend to the Government to strictly follow the provisions on "filing of appeals in the National Litigation Policy document dated 26.3.2010 issued by the then Hon'ble Minister for Law. Seventh CPC is requested to look into this matter once again and to issue suitable guidelines as deem fit and necessary. The CCS (Pension) Rules, 1972 were notified under the powers vested under proviso to Art. 309 of the Constitution and not under the Pension Act, 1871. The Act is a legacy of the former colonial Government The Pension Act 1871 is in the Statute Book but has no relevance or reference to the pension format of the Central Government employees but the Government is sticking to the archaic Act. it is to be remembered that the Government, committed in the Parliament that it will be revised and reflect the latest developments of social security. (refer Lok Sabha discussion on 10th and 16th April 1981). Neither the Monitoring Committee of the Parliament on Assurances nor the Government had taken any concrete steps in revsing 1871 Act. The Gajendragadkar Law Commission had advised the Government of India to change the Pension Act, 1871 in 1972 but nothing was done. Pensioners Association had brought matter to the notice of the Government of India through SCOVA meeting. (a) Section – 4: No Civil Court shall entertain any suit relating to any pension. (b) Section – 6: Shall entertain suit only on receipt of a certificate from the Collector / Deputy Commissioner that the case may be tried, but the court shall not make any order by which the liability of Government to pension is affected. (a) Section - 5 :- The claim for pension to be made to the collector / Deputy Coommissioner. (C) Section – 15:- Confers powers to the Central Government to make rules only to provide for nominations under Section – 12 A. (a) Section – 7:- Relates to pension for lands held under grants in perpetuity. (b). Section – 9;- Relates to saving of rights of grantee of Land revenue. (c) Section – 13:- Relates to Grant of reward equivalent to amount of pension to those who inform about persons receiving pension fraudulently or unduly. No doubt, the subject "Repeal of Pension Act, 1871" comes within the purview of the Law Commission. Two years ago, the Department of Pension and Pensioners Welfare called for opinion of Pensioner s Associations on this, but it stopped at that. Since this Act has been used by the Government to frame the "Payment of Arrears of Pension (Nomination) Rules, 1983, exercising Power under Section – 15 of this Act and since Section – 11 of the Act is also current on date, it appears to be in the fitness of things that the VI CPC suo moto examine this aspect and make suitable recommendations to the Government"
The Vi CPC did not touch the legal aspect of New pension Scheme and simply referred the matter to a study team as mentioned in para 2.3, 2.4, and 2.5. It is further to add that the New pension Act 2013 was placed without repealing the pension Act1871, nor repealing the CCS (Pension) rule 1972 which have been introduced in our country as per provision of Article 30 of the Constitution of India. This action of the Government of India appears to be in taking away the rights and privileges guaranteed under the provision of Article 19 (i) (i), Article 39 of the Constitutioon of India and is liable to be challenged before the country. The Apex Court has already accepted a petition of land Acquisition Act and kept the new act pending operation till judgment is delivered. The VII CPC may kindly examine the need for contrivance of Pension Act 1981 as also the PFRDA Act 2013 and recommend for their Repeal. 1.1 The All India Postal & RMS Pensioners Association while endorsing and submitting the common memorandum prepared on consensus amongst various Pensioners Organisations also submits this Sectional Memorandum on Postal Pensioners issues for judicious consideration of the 7th CPC. 1.2 The Postal Department is the third largest Central Government Department following Indian Railways and Defence. Naturally the Postal Pensioners segment is the third largest amongst the Central Government Pensioners. There are more than 2,00,000 Pensioners on the rolls of the Postal Department's pension roaster. While the common issues of Postal Pensioners are identical to that of the entirety of Central Government Pensioners, there are certain issues and demands peculiar to Postal Pensioners. This Sectional Memorandum is an attempt to place those issues before the 7th CPC for objective consideration. 1.3 The Postal Pensioners who are not covered under CGHS (Central Government Health Scheme) are like their counterparts are granted FMA (Fixed Medical Allowance). But those pensioners who want to become beneficiaries of CGHS are facing discrimination at the hands of the Health Department for years. Those Pensioners who were already CGHS beneficiaries while in service alone are admitted into the CGHS after their retirement. The other pensioners are precluded from joining the CGHS. The CGHS is a scheme wherein every beneficiary is paying at the prescribed rates set by the CGHS. Therefore there is no logic or justification to deny admittance to any pensioner as a beneficiary in CGHS. The Pensioners of various Central Government Departments irrespective of their being a CGHS beneficiary or not while in service are admitted into the CGHS Scheme. The Postal Pensioners alone are denied the privilege of joining CGHS. 1.4 The reason attributed for this non-admittance in CGHS is the existence of one or two Postal Dispensaries in the particular State. The Postal Dispensaries (erstwhile P&T Dispensaries) were recommended to be merged with CGHS by the V CPC. The Government did not act on that recommendation. The VI CPC also recommended similar merger of Postal Dispensaries with CGHS. The Government had subsequently merged only 19 Postal Dispensaries in 12 Cities on the plea that only in those 12 Cities there is CGHS in existence and therefore the merger is feasible only in those cities. This is causing a serious problem because no Postal Pensioner in a particular State where even one Postal Dispensary is existing in any District of the State, to join CGHS. The Postal Pensioners residing under the jurisdiction of the Postal Dispensary in that particular district alone can be catered by that Postal Dispensary. Therefore there is no logic or justification for persisting with the stand that no Postal Pensioner will be allowed to join CGHS, just because there is one or two postal dispensaries in existence in that State. 1.5 The non-admittance of Postal Pensioner alone into CGHS is a clear discrimination being perpetrated against the poor pensioners of Postal Department. The Central Government was brought to notice of this issue by the Staff Side National Council JCM as well several Pensioners Organisations had raised this issue in the SCOVA forum also for remedy. Instead of solving this very important issue of Postal Pensioners, the Government is taking shelter under matter pre-judice clause since some aggrieved pensioners had already moved the Courts in different places. A recommendation by the 7th CPC will sort out this age old problem and help the thousands of senior citizens who are in dire need of medical needs at their fag end of life. 1.6 It is not out of place to mention that the Pensioners were given a favourable verdict in the Central Administrative Tribunal of Kerala and upheld by the Honourable High Court of Kerala also under which the Postal Pensioners residing outside the CGHS area in the entire State of Kerala are permitted to become the beneficiaries in CGHS. Though the Central Government had filed SLP against this judgment, the Postal Pensioners of Kerala State are admitted into CGHS even though they reside outside the jurisdiction of CGHS city and irrespective of the fact as to whether they were beneficiaries of CGHS while in service or not. The benefit of Court Judgments in Kerala should be extended to all Postal Pensioners in other States as well. 1.7 The stand of the Government as against the recommendations of both V and VI CPCs for merging the P&T Dispensaries with CGHS is very negative. Lukewarm response was shown after VI CPC recommendation and after dilly dallying the question for years, the Governmetn ultimately came forward to merge only 19 Postal Dispensaries with CGHS. The Government could have easily merged all the remaining Postal Dispensaries also by converting those infrastructures of Postal Dispensaries into CGHS infrastructure with additional expenditure not unmanageable by the Central Government. There is no meaning in some dispensaries in the name of Postal Dispensaries while a centralized CGHS can cater to the medical needs of all CG Employees and Pensioners in a much better manner. The Postal Pensioners covered under the existing Postal Dispensaries are not considered for treatment of hospitalization facilities is a clear case of discrimination amongst the same category of Central Government Pensioners. A welfare state cannot justify its act on any grounds including on the ground of financial burden to deny the medical needs for one section of Government Pensioners while the same is granted to majority of CG Pensioners. It is recognized by one and all that the Government was spending from its own exchequer towards running the P&T Dispensaries for the benefit of Postal and Telegraph workers without any contribution from employees goes to show that the Medicare is a social welfare measure on the part of the Government towards its work force. Therefore the CGHS though contributory in nature cannot be fully considered as a contributory scheme as it is also a welfare measure towards the CG Employees and CG Pensioners. We appeal to the VII CPC to recommend for total merger of Postal Dispensaries with CGHS without exemption so that all Postal Pensioners can be benefited without any discrimination. 1.8 The Postal Department was segregated from the combined P&T Department on 31st March, 1985. The Telecom Department later converted into BSNL is granting rent free land line phones to all Telecom and BSNL Pensioners and also to Postal Pensioners who have worked in the combined department of P&T for more than 20 years at the time of bifurcation. This means only those employees who were in P&T department in the year 1965 or before are entitled to get this concession. The cut off time fixed by the BSNL is unjustified. Most of today's Postal Pensioners were employees of combined P&T department entered in service only after 1965. Some such pensioners have approached courts and got a favourable judgment and based on those judgments got the concession extended to them by the BSNL. The general guideline of the Honourable Supreme Court of India that all similarly placed persons should be extended the same justice held out to any other person is ignored by the Central Government. This issue is continuously being discussed in the forum of SCOVA but the burden of decision is left on the BSNL which is dilly dallying the question for years together. We fervently appeal to the 7th CPC for a recommendation to the Central Government for grant of rent free land line phone from BSNL to all Postal Pensioners who were recruited when the department was combined one irrespective of number of years' service put in by them in the P&T department. 1.9 There is a tendency amongst the employees of Postal Department to not to seek for residential accommodation in the Postal Staff Quarters for various reasons including owning of their own houses and not suitable to their work spots etc. Many such Postal Staff quarters were left unoccupied causing slow damage to the structure of the building itself. Instead of keeping the Postal staff quarters unoccupied, it would be welcome to allot them to the Postal Pensioners who opt for such quarters. The analogy for serving employees who live in Staff Quarters is recovering HRA besides a standard license fee. In the case of Postal Pensioners the vacant staff quarters according to the entitlement of the cadre in which they retired may be allotted to them on payment of standard license fee only as a token of served the department for a number of years. Similar concession may be extended to family pensioners also. We seek the kind recommendation of 7th CPC in this regards. 1.10 Various Central Government Pensioners like the Pensioners of Railways and Defence are offered special privileges like Railway Pass and Defence Canteens. The Postal Pensioners shall be extended some such concessions by the Government as is available to Pensioners in Australia. The Australian Postal Department (Australia Post) has implemented a scheme called "My Post Concession Account" in which postal concessions are offered to sections like Pensioners holding Pensioner Concession Card etc. The Postal Pensioners should be granted such facilities for free postage in a year. 2.1 The new entrants on or after 1.1.2004 in the Central services are not covered by the Defined Pension benefit scheme but attached to NPS only. However, if any Casual labourer like the temporary status Mazdoors etc are regularised even after 1.1.2004, they should be treated as entered in service prior to 1.1.2004 only as per the judicial pronouncement of Honourable High Court of Madras. In a recent judgment the Madras High Court has held that 16 temporary status Mazdoors who were regularised in the Kalpakkam Atomic Energy Department after 1.1.2004 should be brought under Defined Benefit Pension Scheme and not under NPS by virtue of their entering the services as a Casual labourer well before the cut of date of 1.1.2004. 2.2 In the background of the above judgment we submit that there are thousands of casual labourers with or without temporary status in the Department of Posts without any scope of regularisation for years. Therefore when they get the opportunity to be regularised, they should not be placed under the contributory NPS Scheme but should be brought under the CCS(Pension)Rules, 1972. We request the 7th CPC for a positive recommendation to the Government in this issue. 2.3 Due to wrong interpretation of the DOPT as well as the Department of Posts, hundreds of Casual labourers who have become eligible to be considered for grant of temporary status Mazdoors as per the scheme worked out by the DOPT in line with the Supreme Court of India's directive are deprived of the benefit. The DOPT order facilitates grant of temporary status to those casual labourers who have completed 240 days of service in a year (206 days in the case of casual labourers working in administrative offices) provided they had entered into the service as a casual labourer on or before the cut off date viz., The wrong interpretation made by the DOPT / DoP being that only those casual labourers who have completed 240 days of service on the cut off date itself will be entitiled for the grant of temporary status and that the scheme is not a running scheme for those who completes the eligibility on a subsequent date to the cut off date. This is not only an arbitrary interpretation against the spirit of the Supreme Court directive but also against regularisation of casual labourers themselves in the services. They will be able to be regularised only if they are granted with the temporary status and only if they get regularised they will be able to be made eligible for the defined benefit pension as discussed in the foregoing paragraph. We request the 7th CPC for a recommendation by the Pay Commission for set righting a glare injustice to pave way for converting the period of casual nature as pensionable service. 2.4 There are roughly three lakhs of Gramin Dak Sewaks in the Department of Posts who were recommended by the Justice Talwar Committee for the grant of pension by the Government by treating them as civil servants. This was not accepted yet by the Government. Meanwhile as per the analogy of the judgment of the Honourable Madras High Court, which directed to treat the period of casual nature rendered by the temporary status Mazdoors regularised after 1.1.2004 as employees entered in service prior to 1.1.2004, these Gramin Dak Sewaks also are to be treated as entered in to Postal Services before 1.1.2004 even though they get regularised in the posts of MTS / Postman / Mailguard etc after 1.1.2004 by virtue of their long service as GDS that gives them the eligibility to regularisation. 2.5 In some cases there are judicial pronouncements to the effect that if there is any shortage of service in a regularized post for the eligibility to pension (10 years service) to those employees who were promoted to those posts from the cadre of Gramin Dak Sewaks, then the shortage should be adjusted from the long service rendered by them as GDS. The above judgment has not been extended to all similarly placed employees resulting in them retiring without any pensionery benefit. This is totally unjustified and against the legal pronouncements. We therefore suggest that the 7thCPC may recommend to the Government for allowing such retirees to get pension by treating their shortage if any in the qualifying service from the long service rendered by them as GDS in the past.